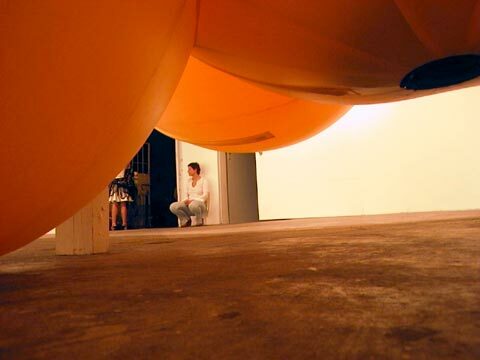 Sioux City, Iowa - A whimsical and intriguing exhibition of bulbous inflatable sculptures by Houston-based artist Sharon Engelstein opens at the Sioux City Art Center this Saturday, and is on view through February 20, 2005. Commissioned by the Sioux City Art Center, "Tethertwin: A New Installation by Sharon Engelstein" consists of two room-size sculptures specifically designed for the Art Center's third floor gallery. Each identical form is individually titled "Sharon's Heart 1" and "Sharon's Heart 2", and remains inflated by an air blower sewn within each vinyl-coated nylon skin. 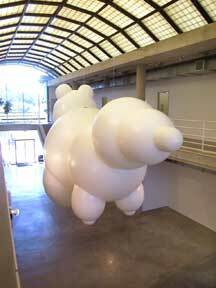 In addition to "Tethertwin", Engelstein's 15 x 23 foot inflatable sculpture "Boya" (2001) will be on extended view in the Art Center's central atrium. Suspended from the atrium ceiling, "Boya" will greet visitors as they enter the Art Center and gaze upward at this utterly ambiguous, yet strangely familiar air-filled sculpture. Engelstein's biomorphic forms were created through the use of Computer-Aided Design (CAD) software, which allowed her to develop and manipulate three-dimensional shapes in the virtual space of the computer. Then using Computer-Aided Manufacturing (CAM), the design was outputted and realized through automated fabrication at Boulder Blimp Company in Colorado. By employing advanced technology to create finished works of art that appear organic and life-like, Engelstein bridges science and nature, the mechanical and the natural. Since the early 1990s, Houston-based artist Sharon Engelstein has been crafting curious and suggestive sculptures that seem to amble between representation and abstraction. While her working method and use of materials have evolved over time, Engelstein's work has maintained a hybrid sensibility-one loosely informed by human, plant, animal, and other organic forms. Her non-specific biomorphic sculptures appear both natural and manufactured, existing today alongside the work of a diverse group of artists, such as Lee Bontecou, Louise Bourgeois, Rona Pondick, and Michael Rees. Opening Reception: Saturday, November 13 from 5 to 7 p.m.